Outside my window... 100% chance of rain. I am thinking... of our friends, Dan and Stacey, and their family. Yesterday I tried posting a few different times, to ask you all to keep them in your prayers, and I just couldn't complete the post... My heart is just aching for them, as it has for so many other friends this past year. Sunday afternoon, one of Dan's sisters let us know that late Saturday night Dan and Stacey lost one of their nine young children, their adorable 2 1/2 year old daughter Rachel, unexpectedly to meningitis. It all happened so quickly and within just a couple hours of showing symptoms, Rachel went to Heaven. Could you all please remember their family, and their extended family, in your prayers? I am thankful for... the reassurance given to us, though our Faith and infant baptism, that little Rachel is now perfectly happy in Heaven, even if it is so very hard for those still here, especially the families of these little ones. St. Rachel, pray for us! I am wearing... a long-sleeved lavender maternity shirt, black fleece maternity sweat pants, and warm fuzzy socks. It is really cold this morning. I am reading... A Life of Our Lord for Children aloud to all my children for history. We are really enjoying it, but it is taking me forever. I can't seem to even get through a whole chapter without having to give my lungs a break! I think, at least for the next month or so, that the boys are going to have to take my place reading if we ever hope to finish this book before Christmas! I am hoping... to have a little time this afternoon to check over my St. Nicholas, "O" Antiphon, and Christmas Lists to make sure I've ordered all the little gifts and supplies I had planned on ordering. On my mind... Father's sermon from Sunday morning Mass. He was reminding us that we never know when our life is going to end and that each and every second here is a gift from God. From the learning rooms... as I mentioned in my "K" week post, we are continuing "L" week for a few days this week as the girls finish up a Ladybug Lapbook/Unit Study. Now that a few other things have come up as well, it looks like we won't even begin "M" until next week. As for the boys, they are working on finishing up a few of their projects before our Christmas break. Living the Liturgical Year at Home... I had wanted to make St. Elizabeth's Crown for her feast day today. Doesn't it look both beautiful and delicious!?! However, with the state of my kitchen right now, it is not looking like it is going to happen... Perhaps I can make it on Thursday, which is her traditional feast day. She is one of the two patrons I choose at my Confirmation! From the kitchen... Do you really want to know? Yesterday, after lunch, I noticed (or rather Snuggles pointed out) that the floor in front of the fridge was covered in water. At first I had the boys just dry it up for me, thinking that Snuggles had pushed on the water dispenser... Then, a few minutes later, it was wet again. I opened the freezer to find that all the ice had melted and everything had defrosted. Needless to say I spent the rest of the day sorting through thawed food, baking a Berry Cobbler with 2 1/2 pounds of thawed berries, making Chicken in the Crock pot for dinner, and juice popsicles with all the juice concentrates which were on the verge of falling apart. What a day! Thankfully a couple of my sisters stopped by on their way home from school and took a couple bags of food/condiments home with them, since my mom has an extra fridge... The rest is on our front porch in a cooler. The appliance repair man will be out in a couple hours. Around the house... So much to do, and so little energy with which to do it... It's amazing how quickly it can totally fall apart when something breaks! One of my favorite things... the looks on my kids faces when they notice or feel the baby rolling around inside my tummy! She has been quite active lately. Saturday ~ A Baby Shower for our little "Rose!" I have been so blessed with such kind and generous friends! 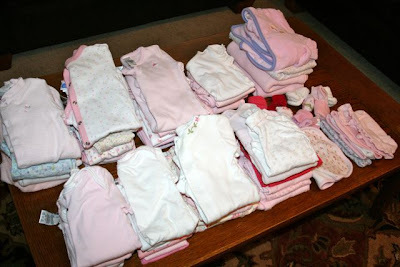 All of the 0-3 month baby girl clothes, wash and folded! 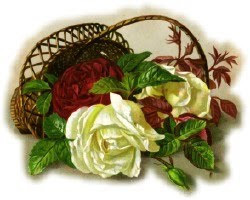 To see more daybooks visit The Simple Woman's Daybook. I am so sorry for your friend's loss. They will be in my prayers today! SO sorry to hear about such a loss. Breaks my heart. Love the picture of all the pink! So sorry to hear about Dan & Stacey's little girl. We are definitely praying for them! I wish I could come to your shower - I hope you have a great time! You are the second friend who is having freezer troubles right now. SO sad, our children are so precious!! My heart aches for them. I guess secretly wishing we lived closer! Love seeing all the pink, a familiar color in our home! I will be keeping your friends in my prayers. I'm so very sorry to hear of their loss. I am so sorry to hear about your friend's loss. We will be praying for their family. If you are up to posting, I'd love to hear more about your Christmas lists this year! I don't even know them, but tears are spilling from my eyes. I cannot imagine the pain. God be with them. On a happier note I am so excited for you Jessica. Which reminds me I have something to finish before Saturday! Oh, such dreadful news. I will keep your friends in my prayers. Oh dear me!! I have a 2 1/2 yr old. I don't know what to say. I will say some prayers for them. Oh - my heart broke reading about your friends's loss. I have a 2 1/2yo girl too. We will say some prayers today. I also would be curious to hear about your O'Antiphons, Nicholas, etc shopping lists. We always celebrate St. Nicholas, but I've wanted to incorporate something special for the week before Christmas! God Bless. Praying for you and your Rose!